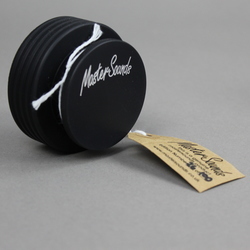 MasterSounds - Turntable Weight Black. Bleep. MasterSounds are the leading light in the world of premium quality audio accessories for the vinyl enthusiast. The MasterSounds record weights are beloved by DJs and vinyl enthusiasts across the world. Each weight is manufactured in the UK to a premium quality and with a level of care and attention to detail that has seen the MasterSounds record weight series are beloved by DJs and vinyl enthusiasts across the world, cited by everyone from Bicep, Metro Area, Gilles Peterson and The Gallery/Studio 54 legend Nicky Siano as an essential accessory for their daily listening habits. The MasterSounds record weights are perfectly designed to reduce unwanted noise while improving the overall sound of your cherished 7"s, 10"s and 12"s. Matching better bass response with truly noticeable sonic improvement, yet light enough to not cause damage to a turntable’s bearing system. This record weight is the perfect aid to everything from DJs looking for assistance cueing a problematic record prior to mixing to the home listener who's favourite LP may be suffering from needle skip. Featuring an anti-slip base, the weight is expertly designed to grip the record to the table. Ensuring that no matter what you listen to, be it the latest ambient reissue or a chugging techno 12" through to some bubbling bassline dub or grime, your wax will stick to the plate with a sustained, clear sound and feel.